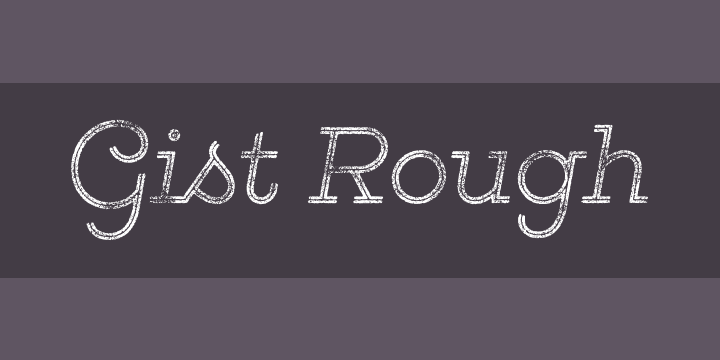 Gist Rough is the letterpress version of Gist from Yellow Design Studio. It’s warm and weathered with a retro yet modern vibe. Every weight includes 3 versions with varying levels of texture which can be used individually or mixed to taste. It has highly detailed texture and looks great even at very large sizes. With 627 glyphs per weight, Gist Rough is highly customizable…either keep it simple with the base character set or use ligatures, alternates and swashes for extra flair. All-caps typesettings have an especially retro edge. Also included are line layers for adding color to the inline areas.